The draw keeps Bristol City four points ahead of the Wildcats having played two more games. 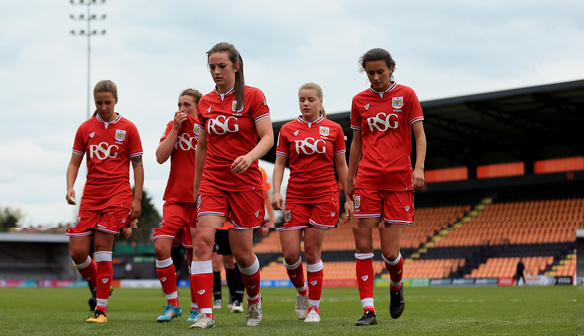 Bristol City midfielder Georgia Evans singled out goalkeeper Caitlin Leach for special praise after her side’s goalless draw against fellow promotion chasers Durham. Leach denied Emily Roberts once either side of half-time before acrobatically tipping Beth Hepple’s effort wide to ensure Bristol City kept a clean sheet. The draw at New Ferens Park keeps City four points ahead of Durham in the FA Women’s Super League 2 having played two more games. “Caitlin (Leach) was fantastic for us in goal, we worked hard but Durham were really strong at the back, we did well but we just couldn’t get that one extra step,” said Evans. “We wanted to get three points from this game, we kept the ball well but we’re a little disappointed with the lack of clear chances we created up front. “Neither team will be unhappy I don’t think, it’s better to go away with a point than nothing, we’re disappointed not to win but it’s not a bad result at the end of the day. “Every single game is like a cup final now, we’re looking forward to next week and the aim is to go and get three points at home. Durham’s Sarah Wilson also highlighted Leach’s performance post-match but admitted the home side were disappointed not to take their chances to claim what could have been a vital three points. The Wildcats have struggled in front of goal so far this season with just seven goals from their nine league fixtures now but have only conceded seven. “Their goalkeeper was the difference, they came here to win but she made a couple of great saves, they’ll be annoyed too with some of the chances they didn’t take as are we,” said Wilson. “We could see clearly from the start Bristol had come for a game, we soaked up a lot of pressure and I think we gave them a little too much respect in the first half. “In the second half I thought we were very good, we created the better chances and on another day we might have walked away with three points.